Acquisition History: Great Bog WMA was purchased from the Griffin Family Corporation in 2006 by The Great Bay Resource Protection Partnership. The Partnership then transferred the property to New Hampshire Fish and Game in 2011. Description: The property is located on the south side of U.S. Route 33 and directly abuts more than 360 acres of other conserved lands to the west and the south. 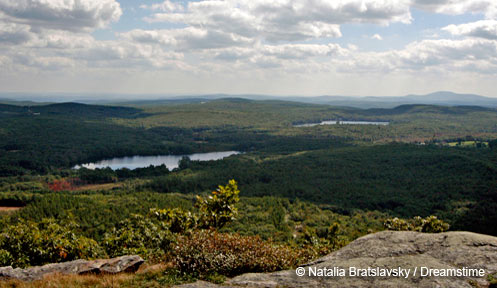 The purpose of the acquisition was to link other protected lands with the Great Bay area, and to protect 167 acres of freshwater wetland and their associated upland buffers to insure water quality protection of Pickering Brook, which flows into Great Bay. Two power line rights-of-way crisscross through the larger of the two tracts while the B&M railroad bisects the two parcels. Common Wildlife: Deer, turkey, woodcock, and cottontail rabbits find a home here as well as a variety of shrubland and wetland songbirds such as the red-winged blackbird, marsh wren, and Northern cardinal. Directions: From I-95, take Exit 3 toward Portsmouth/Greenland onto U.S. Rte. 33 East. A NH Park and Ride will be on left in about ½ mile. Park at the Park and Ride and carefully cross Rte. 33 on foot to reach the WMA across the street.